Global Financial Crisis, Industrial Pollution, Global Warming, Brexit, the Crumbling Euro, Immigrant Crisis – What does it feel like to be leading today? Behind closed doors, many executives confide that they sometimes feel overwhelmed by fast-paced change and complexity. They don’t know what to make of new developments. They feel unsure about important strategic decisions. They are frozen into inaction in the face of steep trade-offs between competing goals. They are humbled by a global economy that feels like an international house of cards—where defaults on mortgages in Indiana can topple the economy of Iceland. Since the turn of the century, something has happened where all these things have sped up and begun to collide. Everyone is looking to you for answers; who do you look to for answers? In other words, to lead in a VUCA world, you need a broad set of skills that you can deploy fast and flexibly to deal with the deep causes of emerging issues. 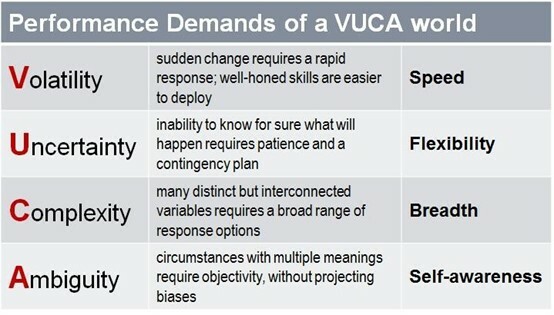 What proportion of the leaders you know are up to the demands of a VUCA world? What is required for you to navigate your organizations through today’s crazy operating environment? 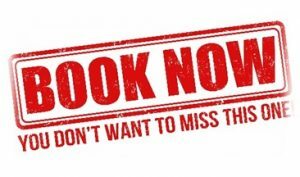 Delegates from several international organizations will be in Dubai on 14-18 October 2018 to attend a seminar on “Leading through VUCA” at The Fairmont Hotel in Dubai. Timely, spot on and thought-provoking seminar – Very challenging to get your team to embrace this paradigm shift. It is really a skill set that needs to permeate from the top to the bottom of the organization. If you have any questions, please contact one of our Training & Competencies Counselors at (training@glomacs.com). If you are a media member and interested in reporting from the event, please contact Mrs. Susan Collie at (susan.collie@glomacs.ae).